Category Archives for "Eating Healthier"
Healthy eating recipes for breakfast, lunch, dinner, snacks and drinks like juices and smoothies. When you begin eating healthier you’ll find your daily energy levels increase and overall health improves. The more you can make up meals and recipes like this to eat each day the healthier you’ll be in the long term. 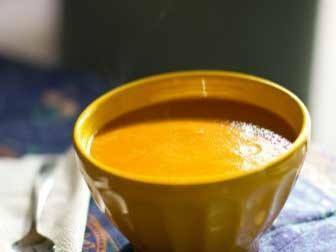 This is a very simple and really healthy soup for the cold winter months and it’s good to have something much better for you than pumpkin pie to make with pumpkins. Pumpkin and coconut go really well together, while the curry paste and bell pepper add a tasty kick to the soup. There’s a lot of health nutrients in this recipe and with all the good fiber it’s surprisingly filling as well. You’ll need a good blender to make up this soup recipe. If you don’t have one I can highly recommend this Hemisphere blender I have in my kitchen. This butternut soup recipe combines antioxidant rich squash with extremely healthy broccoli and its anti-cancer compounds. It also has bell pepper for its high vitamin C, coconut oil and coconut milk for their important medium chain fatty acids and turmeric and garlic for even more powerful antioxidants. It would be hard to make up a butternut squash soup that tastes as great as this does while still being so incredibly good for your health. There is quite a bit of broccoli in this soup, but you’ll find it blends in really well with the other ingredients. Even if you don’t usually like it by itself, this is a great way to get one of the healthiest vegetables out there into your diet. Healthy green smoothies made with fruits like avocado, banana and kiwi are a great way to get a lot of nutrition into your diet. They are also a simple way to use greens like spinach or kale when you don’t feel like eating a salad. In fact, the way greens are blended up in smoothies makes their nutrients much more accessible, while at the same time masking their taste and making them easy to drink for children. Using avocado in this smoothie recipe adds a wonderful creamy flavor as well as all of it’s valuable health benefits. Mixed with the many minerals, vitamins and antioxidants in spinach, along with the vitamin C of kiwi and all the nutrition in banana, this makes for a powerful yet great tasting green smoothie.